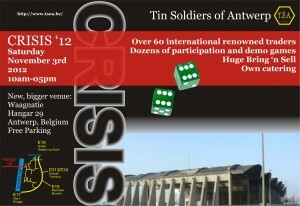 Crisis 2012, for those readers on the other side of the Atlantic, is making its way to Antwerp in November. It is time again to let you know that Crisis 2012 is on november 3rd. Be aware that we have moved to a new venue called Hangar 29, an eventhal in Antwerp next to the river Scheldt. Free parking as usual. Only a few minutes away from our old venue. Be aware that the Dockx hotel is not open in November so if you have booked there, please check with them for other possibilities.